Following the recent disruptive weather, a number of local services were affected. However, all is back to normal after the sub-zero temperatures and snowfall of last week. The Friday bin collection was carried out two days later, on Sunday morning. The parish-council-owned grit bin at the top of Woodlands Road has been refilled. The Milk and More doorstep delivery did not happen on Saturday but is now operating to schedule. And the phone box outside the village shop, which had developed a fault, has been repaired by BT engineers. Potholes remain a problem and are likely to be more so after the freeze and thaw. 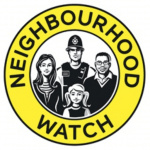 Please contact Surrey County Council to report them, using the link on this website which can be found by clicking on the Home button on the top menu. Finally, a lot of people were out-and-about in the village taking photographs of the snow. If you would like to share them on this website, please do so by using the Submit a Photograph button on the right side of the opening page and following the instructions. They will then be added by the web team to the Gallery section, where some snow photographs are already available to view. UPDATE – As of 17:39 all train lines have been reopened, but trains are running with some delays. UPDATE – As of 12:45 Thursday 18th Jan, there is still no rail service to or from Witley, Milford, Godalming or Farncombe because of a fallen tree at Milford, which has caused extensive signalling damage. Disruption is expected to continue until 16:00. You can check the status of this disruption using the following link: https://www.journeycheck.com/swr/search?from=&to=WTY . High winds overnight have brought down large numbers of trees, blocking roads and rail lines across the county, including at Hambledon Road and Milford Station. South Western Railway reports that a fallen tree is blocking the line at the station and engineers are working to clear it (as of 9am Thursday 18th). Rail replacement transport is in place. 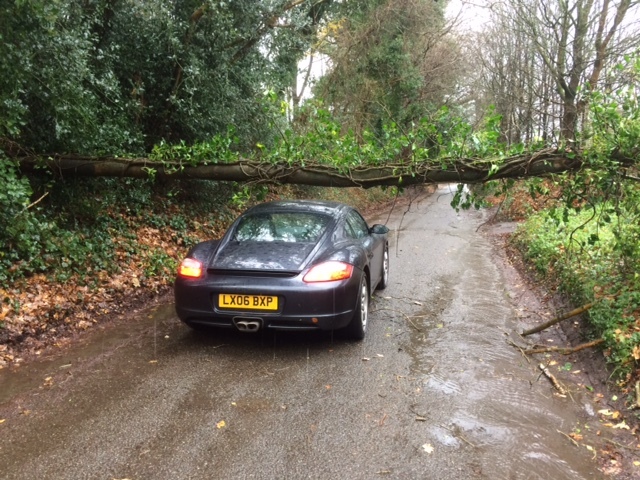 A fallen tree is completely blocking Hambledon Road close to Clock Barn Farm, so the direct route to Godalming from the village is impassable. Given the scale of tree debris across the area it may take some time before the road can be reopened. There are long weather-related delays on the A3, M25 and A281. Many other routes are affected by fallen trees and other debris and travellers are advised to use the contacts on this website’s winter weather page to check for further details. 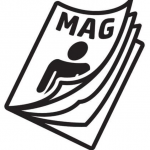 The link can be found at the top right of the opening page. 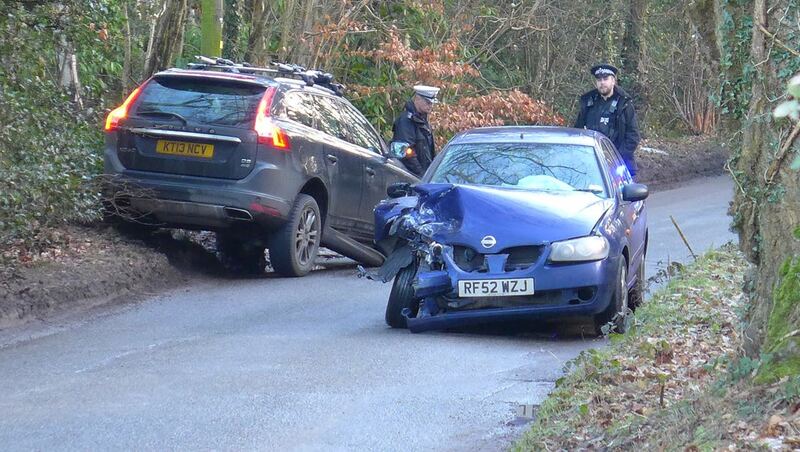 This has been reported to Surrey County Council and to the police. Update: By 1pm the tree had been cleared by a local resident. 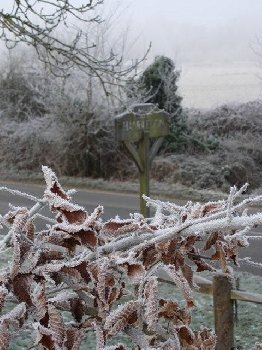 However there are many simple precautions people can take to make sure they can cope with cuts to power supplies and phone lines, a problem that has affected Hambledon in the recent past and usually caused by high winds or heavy snow. Keep torches handy and make sure that you have a supply of batteries. 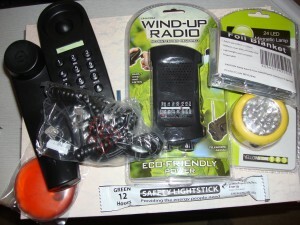 A battery-operated radio will also come in useful for listening to local radio bulletins. 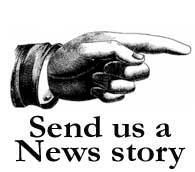 Tune in to BBC Surrey on 104.6FM or Eagle Radio on 96.4FM. A major cut of trees close to power lines was completed this year by Scottish and Southern Energy in an effort to reduce the frequency of electricity supply disruption to Hambledon. SSE has also upgraded and refurbished power lines into the village and promised better communications in the event of outages. Nevertheless, it is wise to take precautions in a rural area that has suffered from extensive power failures in recent years, usually caused by trees and branches falling onto cables during high winds. SSE has provided the Parish Council with a quantity of telephones that do not require a power supply to work, wind-up radios, battery-operated magnetic lamps, safety lightsticks, compact foil blankets and heat packs for warming cold hands. If you, or someone you know, would benefit from any of these items they are available free for collection from the village shop. It is important to remember that many modern phones require power to operate so a stand-by phone that simply requires a connection to the telephone line is an essential. Stock up on batteries for torches and radios. In extreme weather electricity and telephone lines may fail as may mobile phone networks. Snow or fallen trees can isolate the village. Although such an outcome is rare it has happened. The Parish Council has an emergency plan in place to help cope with such an event. 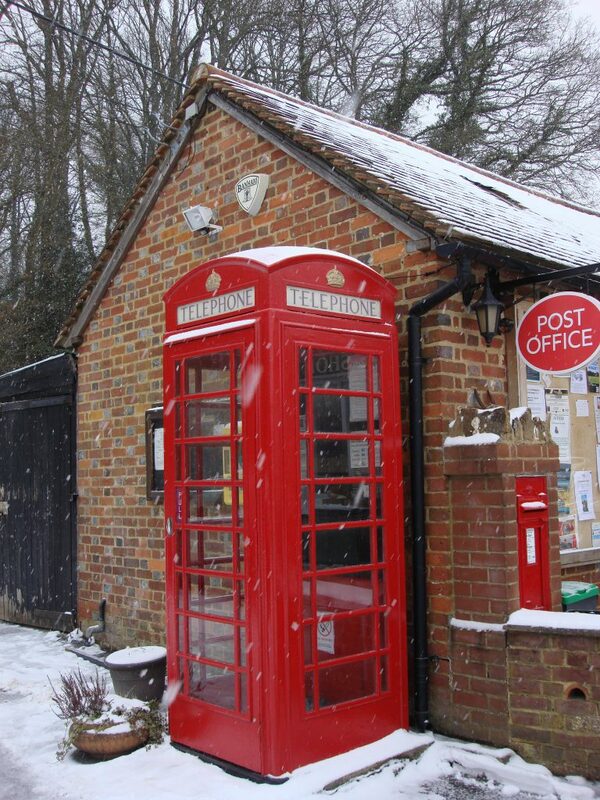 It is worth remembering that the phone kiosk at the village shop will continue to work in a power failure. The pay phone no longer accepts coins but you can dial 999 for free. You can also dial 100 for the operator to make reverse charge calls. If you, or someone you know, may be considered vulnerable during a power cut, you can register with SSE’s Priority Services Register on 0800 294 3259. There is a leaflet in the shop explaining this service. The following telephone numbers and addresses should be kept handy. SSE – Scottish and Southern Energy (power cuts and emergencies): 0800 072 7282. Surrey County Council (for on-line updates and advice): www.surreycc.gov.uk/winter. In the event of severe disruption and communication failure the emergency team will be on hand around the village, centred at the village shop. This weeks special is Spicy Meatballs in Salsa with Mozzarella. BBQ Chicken, Honey & Mustard Chicken & Pastrami, dill, tomato and mustard. 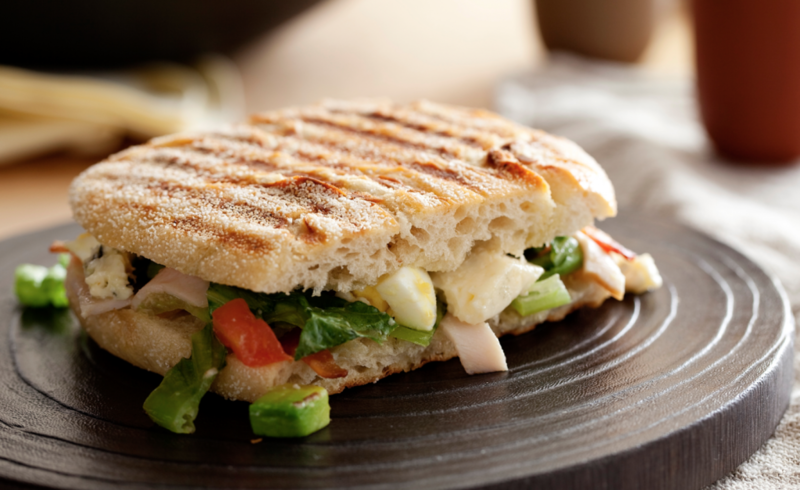 Homemade soup to eat in or take away. Forecasters say that the worst of the severe weather that caused power loss and flooding over the Christmas and New Year period is over. The partly re-surfaced Hambledon Lane has taken a pounding and deep gullies have opened up on either side of some stretches, now marked with a succession of cones. The new surface has broken and bulged in places and, at the Hydestile end, the old surface is in a dreadful state following flooding. Work has yet to restart on finishing the resurfacing, but it is clear that contractors will need to revisit some parts already completed. 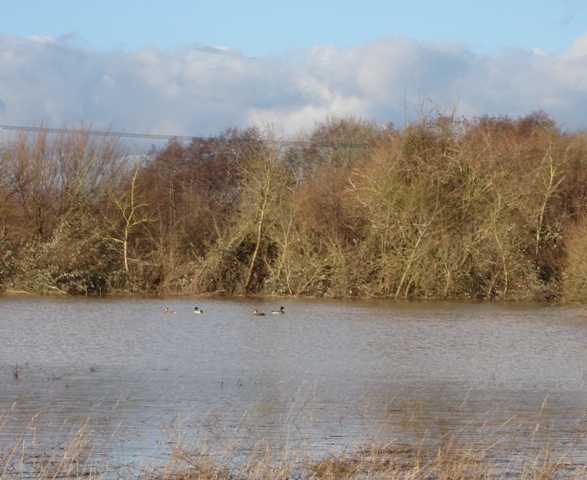 Only ducks seems to have enjoyed the miserable weather, with several pairs taking up residence on the “lake” that has formed in the field at Hydestile. Last winter Hambledon suffered from extensive power cuts when high winds brought down power lines. In a rural and heavily wooded village it was trees and branches falling onto electricity supply cables that caused most of the problems. SSE, the power supplier, has embarked on an extensive programme of tree cutting around high, and some low, voltage lines to clear them of overhanging branches that pose a threat to power distribution. It has also pledged to improve communications at its emergency call centre. A lack of up-to-date information was one of the major frustrations last winter. In the event of a power failure customers should, in the first instance, contact SSE on 08000 727 282 to report the problem. 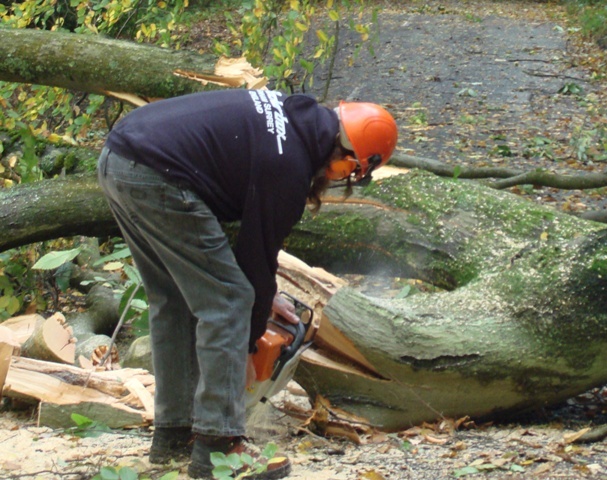 Hambledon echoed to the sound of chain saws today as local volunteers cleared trees blocking the villages’s roads. Parts of Hambledon were left without power this morning, particularly along Vann Lane beyond the cricket green. An oak has been brought down by last night’s storm and is lying acoss the road beside the track to Oakhurst Cottage. It is blocking the road and has brought down electricity cables. It is a large tree and it will need to be cleared by contractors. 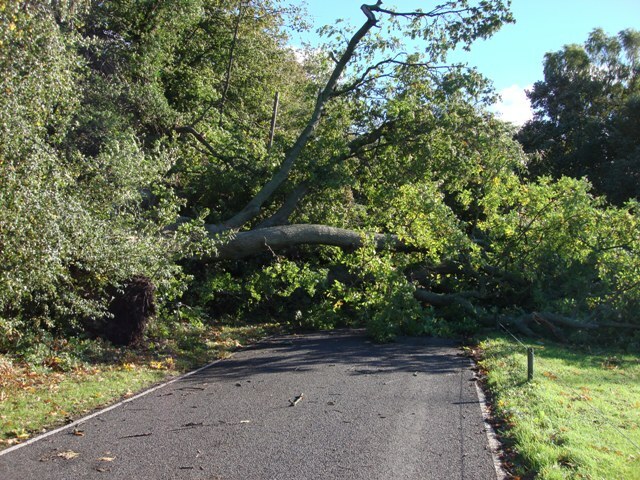 Surrey County Council highways department has been informed, but with hundreds of trees down across the county it is likely to be some while before it is dealt with. People should use Woodlands Road to gain access to Vann Lane. Two beech trees blocked Malthouse Lane between the village hall and the Cricket Green turning. Tim Coleman, Arthur Frearson and Stewart Payne used chainsaws to clear the road which was reopened by 9 am. Following a successful appeal last year, the nation-wide Surviving Winter 2012 Scheme, of which HCF was a part, has now launched again to support older and more vulnerable people through the winter months. Thanks to your kind donations last year, and this, we now have funds ring-fenced within the HCF to support the elderly and more vulnerable people within our community. Indeed an individual grant to help with the purchase of fuel has recently been made. If you receive your winter fuel cheque from the government this year and are fortunate enough to be able to offer it to the Surviving Winter scheme, please follow directions on our ways to donate page. Equally, if your group supports older or vulnerable people within the village and you require funding, or you know of any individual in need of support, please contact us. We act in confidence and grants of this kind are not publicised. The current cold spell and today’s light dusting of snow provide a timely reminder of the arrangments in place in the event of severe weather. 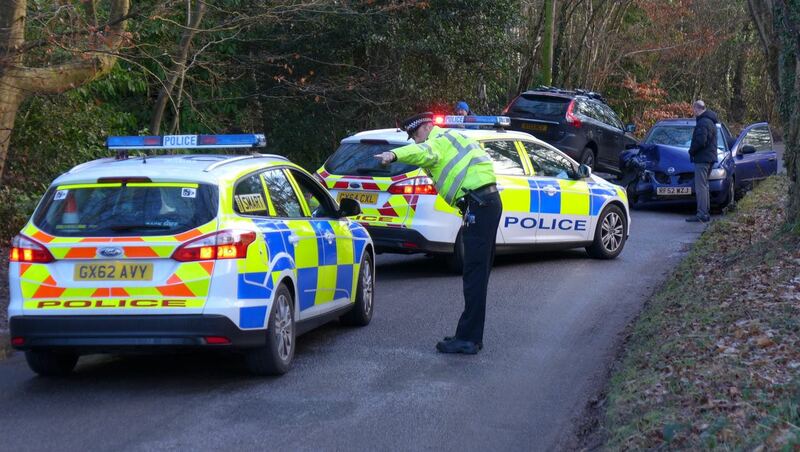 Hambledon has an agreed emergency plan, prepared by the parish council, and linked to arrangements at both Waverley Borough and Surrey County Councils. 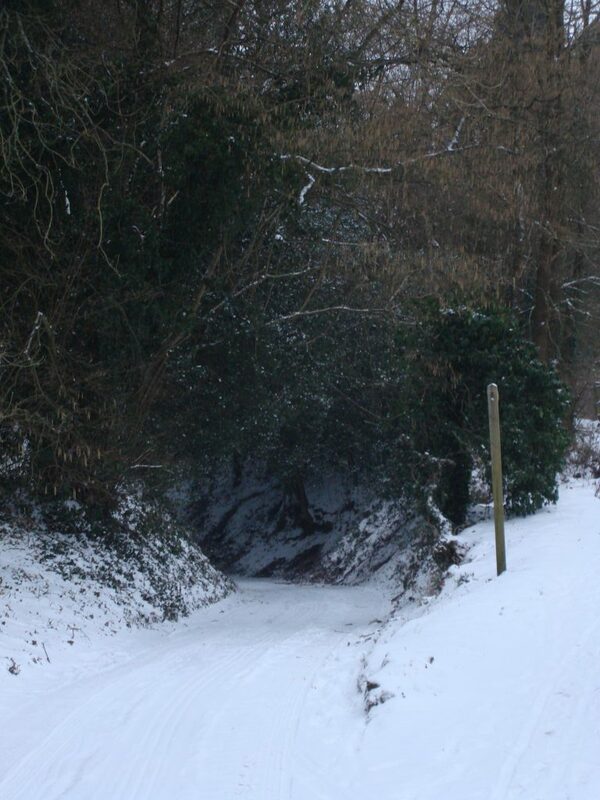 The parish has been assured that if snow is forecast Hambledon Road, from Lane End to Hydestile and beyond, will be gritted by Surrey County Council. This same stretch of road is also listed as a priority route for snow clearance. Once again Peter Knight of Burgate Farm has agreed to use a plough blade provided by the county council, fitted to one of his tractors, to clear roads that will not be swept by SCC. These include Salt Lane, Vann Lane, Roundals Lane and Cricket Green. 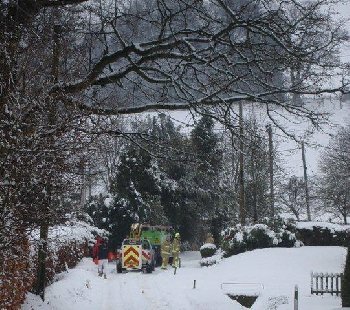 Parts of Hambledon were without power today (Sunday Feb 5th) after overnight snow brought down a power line at Church Lane. 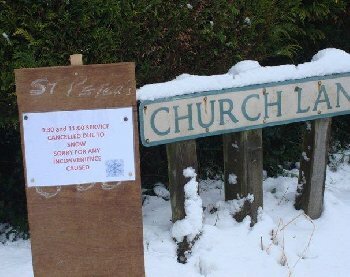 The morning service at St Peter’s Church was cancelled because snow made the lane impassable and the power cable was still live and producing sparks where it was in contact with the ground. Engineers from Southern Electric were carrying out repairs and a fire engine was on standby at the junction of Church Lane. Malthouse Lane and Woodlands Road were among areas without power but the village shop was not affected and was open as usual. Volunteers had cleared a path to the door. 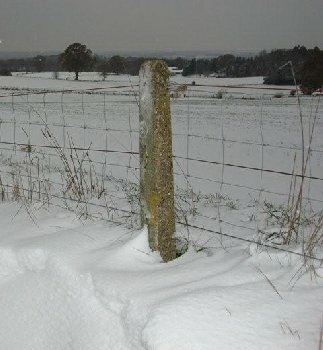 Peter Knight, of Burgate Farm, cleared many of the smaller roads in the village as part of an agreement with the parish and county councils. He has been provided with a snow plough blade to fit to one of his tractors by Surrey County Council. 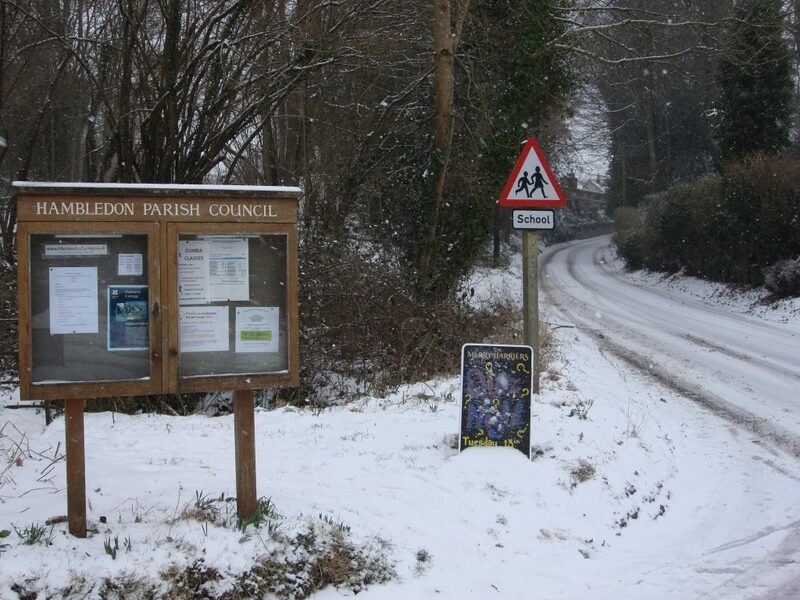 And SCC had gritted Hambledon Road before the snow fell and later went through with a snow plough. Tim Coleman and Stewart Payne, part of the village volunteer team, cleared branches from a tree that had been brought down by the weight of snow and was partially blocking Rock Hill. Elsewhere, children were enjoying the snow and using toboggans in fields around the village. Overall, the arrangements in place to deal with snow appeared to have worked well. Between three and four inches of snow fell in the late evening and the early hours of this morning and many roads were impassable for a time to all but four wheel drive vehicles. But, because Hambledon Road had been spread with a mixture of salt and grit, the snow had largely melted away by this morning. Details of Hambledon’s winter planning arrangements and contacts numbers can be found in the previous news item on the Latest News menu. 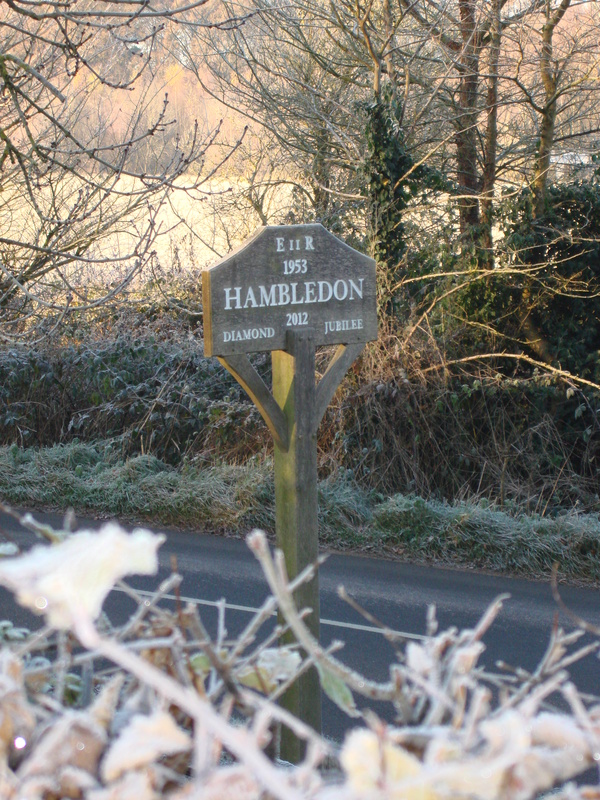 Once again Hambledon is in the grip of snow and freezing conditions, so it is a timely opportunity to review what plans have been put in place for this winter. 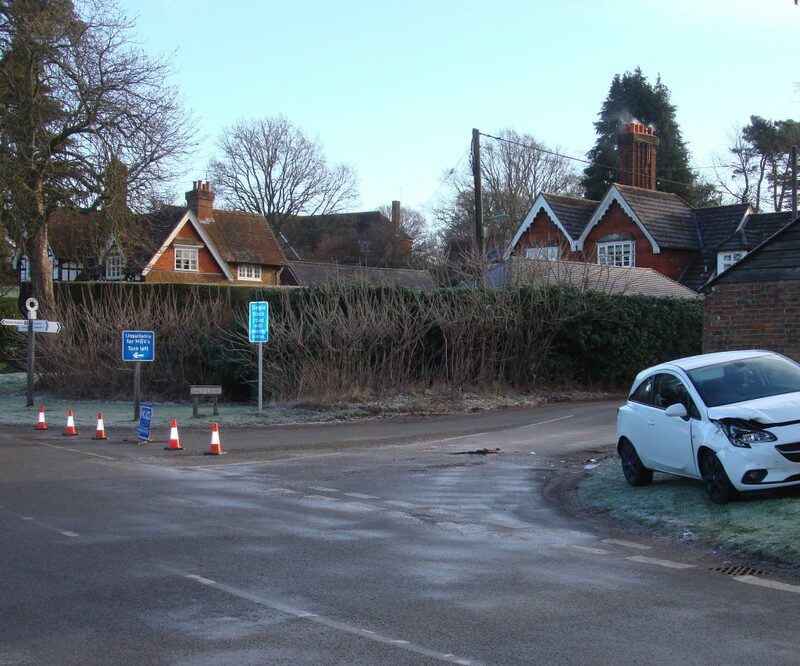 No one will need reminding of the disruption the village suffered during the heavy snow of January, when Hambledon was effectively cut off for a week and without power for three days. 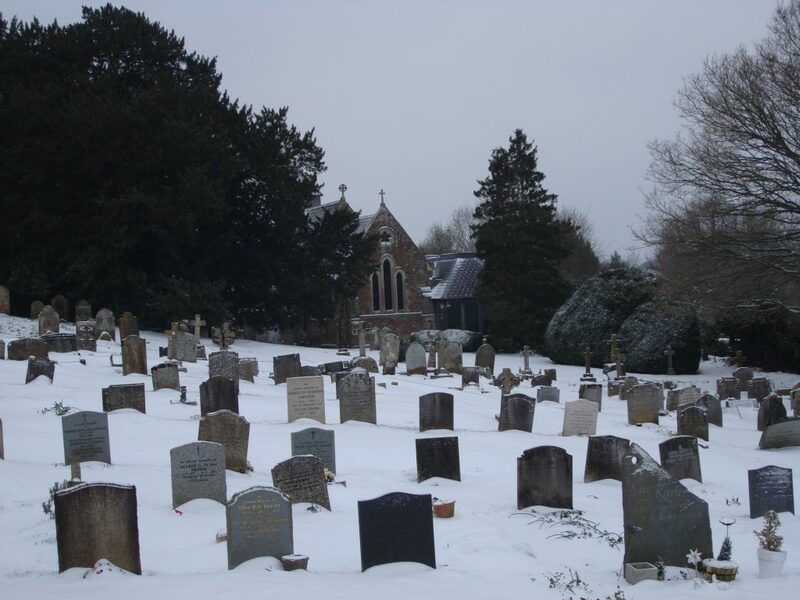 This winter snow has arrived early, but the parish council has been working to ensure residents are not held hostage to the weather to the extent they were ten months ago. With the help of Andrew Povey, our county councillor, we have been assured that Hambledon is included in the Priority One gritting network. This means that when freezing conditions are forecast, Hambledon Road will be treated along its full length through the village, although not until major roads have been gritted first. Severe weather conditions are continuing to create problems on Hambledon’s roads. A large pothole has opened up in the middle of the road at Lane End. It is so deep that nearby residents have had to fill it with bricks to reduce the danger of it shredding tyres. In addition, surface water turning to ice makes the road extremely hazardous at this location. Please approach with caution. The pothole has been reported to Surrey County Council by Hambledon Parish Council. However, the length of time it took to speak to an operator on the emergency number suggests that SCC has been inundated with similar reports from across the county. Although details of the Lane End pothole have been passed to the Highway Department, SCC could not say when the road will be repaired. There are, of course, other potholes throughout the parish. And with temperatures remaining below freezing point great care should be taken on all the village’s roads.